Wow what a day the times just flew!!!!!!!!! !....washing dry and now the greatest of joy..the ironing lol!!!! i have been trying to get my colouring in better and found KIM http://www.justwordz.ca/ on you tube and blogger she uses pro markers and has such a easy going tone that i could watch and listen to her all day colouring in....so with her help and my viewing this is what i came up with i give credit to her for the colour combo too as im quite useless in bright colours...and although i mucked up me boots... i loved the image she coloured i just had to buy it from. Fabulous card! Gorgeous image, love the layout and her hair is just fantastic! As for ironing.....I have a basket full.....but there's always tomorrow lol! WOW!! Check out your colouring Sassy - it's wonderful!! I love the image and the colour scheme is gorgeous. A fabulous card. I love the colouring - the hair is wonderful. Wow Sassy what fabolous card and your coloring is gorgeous!! 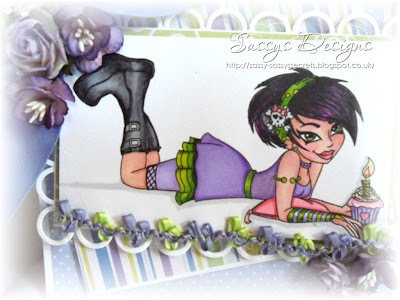 What no pink lol, Fabulous card Sassy, I like the image the colours the big bow and the flowers. So sweet and cute, love the image Sassy. Love that stitched ribbon too. This creation is AWESOME Sassy! and WOW! look at that marvelous coloring! LOVE the little streak of purple in her hair ... so retro!!! LOL! Fabulous job my friend ... well done! Fantastic, not that there was anything wrong with your colouring in the first place! she is lovely and you certainly haven't mucked up the boots at all!!! I love your card, no matter what you are saying! Fabulous card Sassy, and I agree with you about Kim's colouring tuts she is fab....thakns for entering our hop challenge. You coloured her up perfectly. I think her boots turned out great. When I did her, I messed her boots up, so just cut them out of the image, lol.